Recently, there is a trend of using the steel shipping container to construct residential homes and office spaces. You can find shipping containers for sale in Sydney and around the world. Many prefer using shipping containers as homes, office spaces, commercial spaces, etc. because they are strong, portable, easy to construct, and affordable. Corten steel containers are stronger than traditional steel and are less prone to corrosion. They can withstand harsh weather conditions and salt water. Companies use Corten steel on the outside and inside of shipping containers to make them stronger. In addition, these steel shipping containers come with eco-friendly insulation, making them an ideal choice for comfortable, energy efficiency homes. Besides the insulation, the bottom floors are constructed from hardwood such as birch or teak, which can hold massive weight. If you’ve come across a new or used shipping container for sale in Sydney, you’ve probably contemplated what else you could do with it? While millions of cargo containers are still being used to transport freight, just as many are being stacked unused. You can help save yard space and the environment itself while getting yourself a sturdy framework for living space. Most shipping container homes use 40-foot units. Standard 40 feet shipping containers are eight feet wide and 8.5 tall, and each one gives you about 300 feet of living or office space. Situating four of these of these containers side-by side will create a three-bedroom house around 1,200 square feet. No one would believe it started off as a shipping container. All over the world, architects have been designing container homes and office spaces. Some are colorful, while others are more subtle. Poteet Architects used bold colours in their container guest house. Besides painting the facility a vibrant blue, they cut two sections for windows as well as an area for glass sliding doors to add to the decor. They added extra panels to the roof to catch any rainfall as well as adding a porch to relax on and enjoy the beach. The interior was also decorated in bold blue fabrics and highlighted with red and blacks. 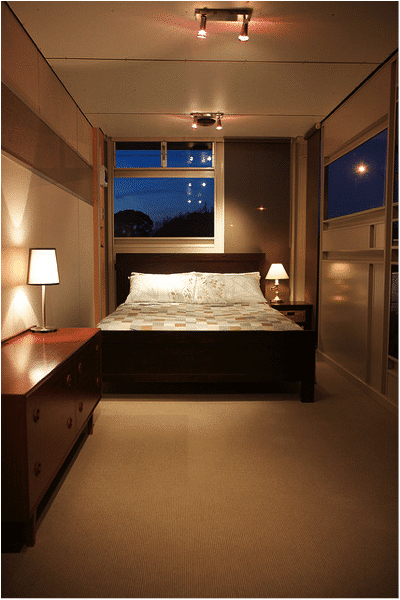 Jeff Wardell and Claudia Sagan chose to convert two shipping containers into a home office and guest bedroom area and place it off their already existing home. This home office inside a sturdy blue container allowed Jeff to run his online art gallery peacefully, while still being nearby. If he gets tired, they added a bunk bed in a small loft area. They’ve built it to be a warehouse setting with a bit of home in it. David Fenster created this natural masterpiece out of six shipping containers, and a forest of dense redwood. He utilized every space, placing the containers a few feet apart, which allowed for a glass spine to let natural sunlight in. The inside consisted of sturdy hardwood floors, a staircase constructed from redwood, and a gated bridge. These features added to the ambiance of the container home, but these types of wood were also strong and reliable. These structures should serve you as inspiration to build your own shipping container home or business space.